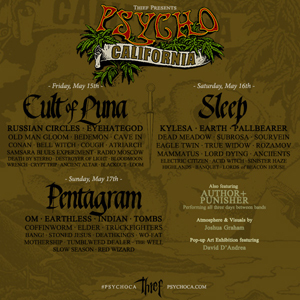 Psycho California, the west coast’s first annual metal festival and a must see for fans of doom, heavy psych and sludge, have announced the release of individual day passes as well as the daily line-up for the three-day outing. Virginia doom outfit COUGH have joined the line-up as have SOURVEIN, who recently announced a new album, Aquatic Occult, which will be out later this year via Metal Blade. Josh Graham, who has created on-stage light shows and visuals for a number of artists including NEUROSIS, MASTODON and SLEEP, will be creating a unique light display for the festival. Lastly, illustrator David D’Andrea, whose art is displayed both at galleries and as packaging for a variety of bands and brands (OM, Converse, Earth), will have a pop-up gallery. Individual day passes will be on sale Friday, Feb. 13 at Midnight PST and available via Psychoca.com. A very limited number of 3-day passes remain available with VIP passes having already sold out. Single day tickets are $64.50 while 3-day passes are $149.50. Festival interludes will be provided by Housecore Records’ artist AUTHOR & PUNISHER and vinyl DJ set from Bob Lugowe (Relapse Records) and Sean Pellet (LAST DAZE HERE).